Scott was practically jumping up and down like a kid when I came into the kitchen a couple of mornings ago. He enthused, 'Something amazing, incredible, magical happened!" Then he dramatically dragged out the pause to drive me crazy with curiosity! I'd never seen him like this. "What, what, WHAT???" I'm imploring. Finally he said, "Remember that gym equipment handle we've been looking for everywhere for this past year, since we moved?" Of course I remembered that lost handle! We couldn't find it anywhere. We tried to replace it and nothing fit. We'd been using gloves to grip the bare screw to adjust the height. With bright eyes he continued, "This morning it appeared on my office window sill." "I've sat at that desk every day for the past year. The window sill is always empty, uncluttered, nothing there.... till today." My mouth was hanging open, then I started laughing. I shared with him a miraculous event in my book, Things Are Going Great In My Absence. During my 21 days of silence 14 years ago, the tiny wire handle of my miniature flashlight broke off, and part of the handle was gone. I sat the flashlight on my nightstand, and in the morning, the handle was back on it, in one piece. Mind you I never chase flashy metaphysical experiences. I think of magical metaphysical experiences as candy--they're a nice treat, but they're not the daily diet of a spiritually mature person. Spending time deep in the empty Void is more impactful and profound. As is changing someone's life forever. Scott and I agreed that we always want to cherish those magical, reality-defying gifts and let them be a sign that we are far more powerful than we know. To never forget that we're so much more than these physical, limited, human bodies. But we live here, now. Mundane experiences are what life is mostly made of. I do take time to focus on the Non-Physical aspect of life a little each day, to keep that awareness afloat in the swift current of life. When we do those simple but important things it tends to open us to magical experiences without trying. Living in the flow, it doesn't seem like magic that our lives go so great, that things are so easy--it just seems normal. It looks like magic to people who don't live in that state. It grounds you and stills the mind. We're doing it for us, AND to make our little Heaven even more stunning for the September retreat. To prepare for the retreats I do grounding things like that. There's no need to do anything to call up the magical retreat energy--it will just be there--it always is. "Don't get attached to the flashy. Stay grounded; learn to appreciate the mundane with the sublime. Get a Grace boost from this video! 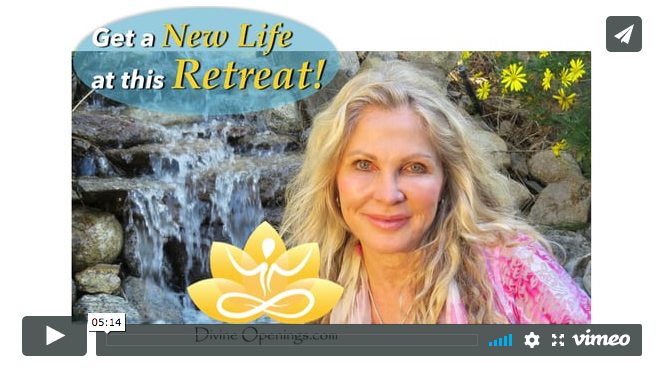 Also see new videos with participants sharing what happened in their lives. Questions? Our team loves to help! The 2018 Updated books are here! We love self-publishing our English books, because we can update the the text anytime Lola wants. She is always evolving Divine Openings on the leading edge. You can also order them from book stores and online outlets worldwide. Stay immersed. Feed your soul. Keep expanding. People get so much from the first book and Portal 1 Online, many don't realize that's just Portal 1 of 5. There is so much more--it's endless. Continue the journey into being your Large Self more and more of the time. How to put more focus on your Non-Physical, unlimited, expanded self. Get that continued immersion instead of letting TV, phones, social media and lower-quality distractions sap your focus by default. Gee, Lola sure has aged! The point is: sometimes you want a Mentor! In the Mentoring Program you get to be mentored by Lola for a year, enjoying leading edge teachings, guidance, and community.